These findings will promote the development of new strategies to control this disease. Ainelén Piazza, Jorgelina Ottado, Betiana Garavaglia and Natalia Gottig. Photo: courtesy IBR. Significant advances in plant-pathogen interactions were made at the Plant-Microorganisms Interaction Laboratory of the Institute of Molecular and Cellular Biology of Rosario (IBR, CONICET-UNR). This laboratory has long experience in the study of citrus canker, a disease caused by a bacterium called Xanthomonas citri subsp. Citri, which is one of the main phytosanitary problems of Argentine citrus farmers. There are no plants that are resistant to this disease. Therefore all citrus such as lemons, oranges, mandarin oranges, kumquats and grapefruits are affected by this bacterium. In collaboration with researchers of the Max Planck Institute in Germany and KAUST in Saudi Arabia, a recent study published in Journal of Experimental Botany revealed a new mechanism used by Xanthomonas to survive on the surface of the leave. 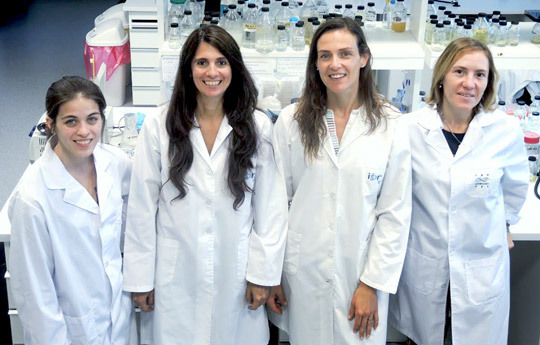 “The infection begins when the bacteria enter the plants through the stomata, which are small pores on the surface of the leaves which enable gas exchange with the environment, or even through the lesions of plantas”, Natalia Gottig, associate researcher of the CONICET and leader of the project, describes. Once the bacteria enter the plant tissue, they multiply and finally produce a characteristic brown eruptive lesion called “canker”. The bacterium remains upon the protuberance on the leave, and when it rains or there is strong wind it emerges and moves, thus spreading the disease to the whole plant and even other citrus plants. Severe infections can lead to mass defoliation that weakens the plant and reduces its capacity to produce fruit. It does not affect the flavour, but as the tissue of the peel is damaged, it could favour the colonization of other pathogens and the fruit may rot quickly. Infected fruit can be marketed locally but can not be exported, thus limiting exportations. Thus, the group studies the mechanisms the bacterium uses to infect the plant and how it can defend itself from the pathogen. The researcher highlighted that some of the central themes of the study were the adhesion of the bacteria to the plant, a basic stage for the future development of the disease and its ability to associate itself with other cells of the same bacterium and form a community called biofilm. “This growth as a biofilm allows the bacterium to survive in adverse environmental conditions and to remain longer on plant surface, therefore increasing its infective capacity and extending the infection”, Gottig describes. The IBR scientists proved that this pathogen produces a sugar called trehalose, an osmoprotective substance important for the development of the citrus canker because it allows bacterium to survive environmental stress situations of the plant surface. Through metabolic and proteomic studies, the study found that the trehalose produced by the bacterium modifies the physiology of the plant tissue in order to favour the pathogen’s growth and thus ensuring the development of the disease. Nevertheless, this sugar is a double-edge weapon due to the fact that citrus plants have evolved and can detect this molecule and trigger defence responses to counteract the pathogen’s attack and limit the development of the disease. For the first time, this study has described the dual role of the trehalose in the plant-pathogen interaction. “To know how this molecule can activate the defence response of the citrus plants allows us to develop new strategies that use this sugar to control canker and other citrus diseases”, the researcher concluded. Natalia Gottig. Associate researcher. IBR. Jorgelina Ottado. Independent researcher. IBR. Betiana Garavaglia. Assistant researcher. IBR. Ainelén Piazza. Doctoral fellow. IBR. Florencia Ficarra. Doctoral fellow. IBR.